If you are going to start a new Magento 2 store soon, Plumrocket has something special for you. The company offers a tiny improvement that will help you attract customers even if your ecommerce website isn’t launched yet or is under maintenance. Meet the Coming Soon & Maintenance Page Magento 2 module. Below, we shed light on its functionality. So, what are core purposes of the extension. First of all, it allows you to subscribe customers even before your storefront is available publically. Don’t waste time that you are going to spend for launching a website. Use it with the maximum effectiveness. While developers will configure your Magento 2 store, you can already attract potential buyers. The second core goal of the Plumrocket Coming Soon & Maintenance Page Magento 2 extension is related to maintenance mode. While applying updates or fixing bugs, you can easily switch to maintenance mode informing customers in the most efficient manner. Thus, the extension allows you to choose from 3 different modes. The two of them were mentioned above – Coming Soon page and Maintenance Mode, as for the third one, it is Live Website. Since everything is clear with the third mode, we should tell a few more words about two others. The most important aspect of the Coming Soon mode is the ability to enable a signup form. The Plumrocket Coming Soon & Maintenance Page Magento 2 module offers two methods. You can either provide customers with the ability to subscribe to newsletter or combine this opportunity with creating an account. For the second method, it is possible to add up to 20 additional fields necessary for registration. 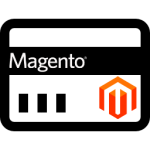 Another vital feature provided by the Magento 2 extension is a countdown timer. 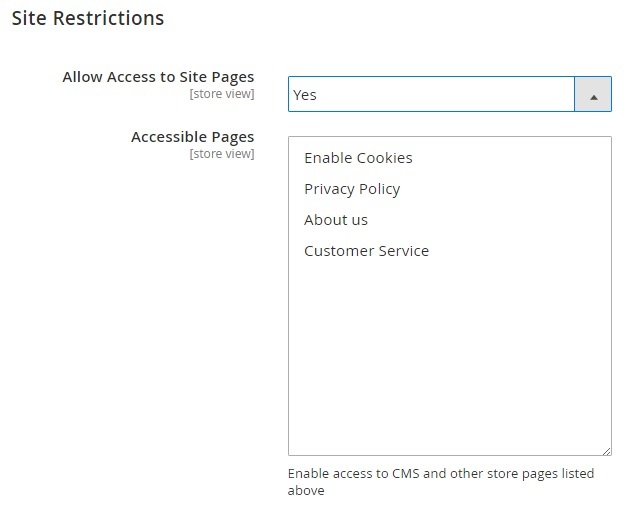 You can even enable the Coming Soon & Maintenance Page Magento 2 module to switch to a live version of your store automatically at launch time. Alternatively, it is possible to set only launch date and time. 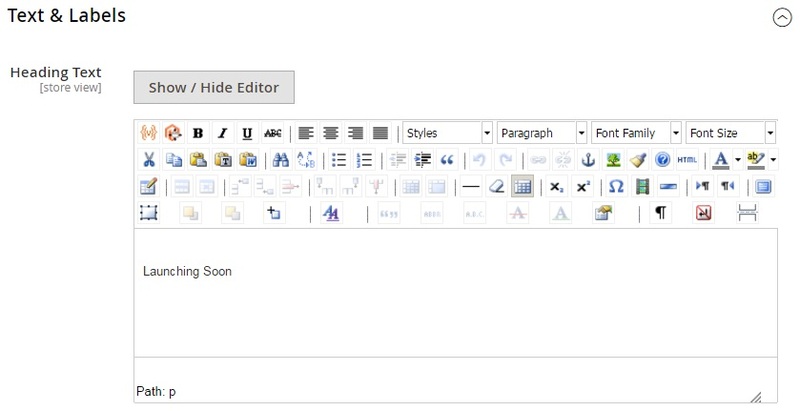 And you can enhance your Coming Soon page with various content, such as text, tables, images, and social media links. 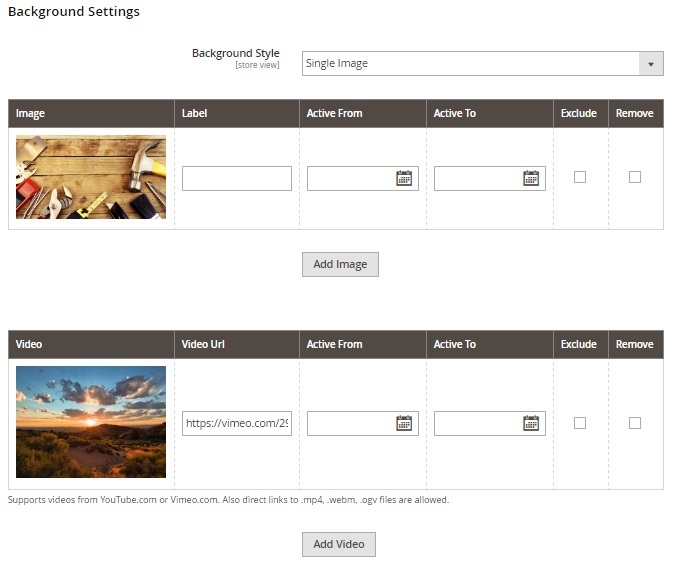 As for background types, they are: Single Image, Slideshow, and Video Background. For the first two types, you can set dates when images are active. Thus, the extension can hide them automatically. As for videos, you can add them from both YouTube and Vimeo and create an endless loop. At the same time, the Plumrocket Coming Soon & Maintenance Page module allows to add custom videos. It is also necessary to mention that you can hide the whole website or just selected pages from visitors. Sometimes it is better to provide a limited preview of a storefront to increase its attractiveness for potential customers. 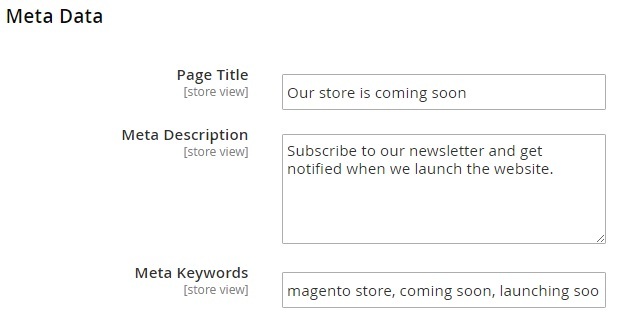 And to make your Coming Soon page more appealing to search engines, the Plumrocket Coming Soon & Maintenance Page Magento 2 extension allows to add meta data. Also note that a new Coming Soon page can be previewed from the backend, so you can always fix all problems before your customers will discover them. As for maintenance mode features, Plumrocket allows you to add a countdown or set launch date and time as well as turn live mode automatically. During the maintenance mode, the page can be refreshed every couple of minutes returning one of two HTTP response headers. Besides, the aforementioned background types can be fully leveraged as well as texts and labels. The preview mode is available for the maintenance page as well. For both Coming Soon and Maintenance Mode pages, the extension allows to create a white list of IP addresses. Thus, you provide developers and administrators with the full access to your Magento 2 website. These were all the core features of the Plumrocket Coming Soon & Maintenance Page Magento 2 extension. Now, we are going to start the backend tutorial and then provide some illustrations of the module’s frontend appearance. Go to Plumrocket -> Coming Soon & Maintenance Page -> Manage Website Mode. Here, you can select and preview one of the aforementioned website modes: Live Site, Coming Soon, or Under Maintenance. Both Coming Soon and Maintenance pages have their tabs with settings. Let’s take a look at the first one. The Coming Soon Page tab consists of 8 sections: Coming Soon Page, Sign-up Form, Launch Settings, Text & Labels, Site Restrictions, Social, Meta Data, and Background Settings. In Sign-up Form, you enable/disable the form and choose the method. We’ve just mentioned that it is possible to signup for newsletter only to combine it with a registration of a new customer account. In the second case, the Sign-up Form section contains a grid with additional registration fields. Now, let’s explore launch settings. 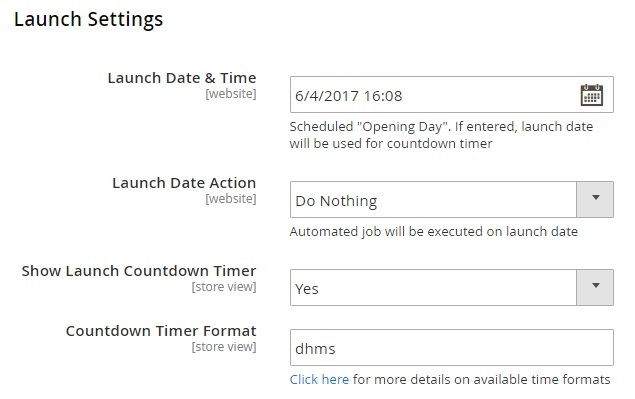 Here, you can specify launch date and time to schedule the opening day and use them in a countdown timer. As for Launch Date Action, it allows to turn to a live website or do nothing. Next, enable a countdown timer and specify its time format. In Text & Labels, you can create heading, welcome, and registration confirmation text messages. 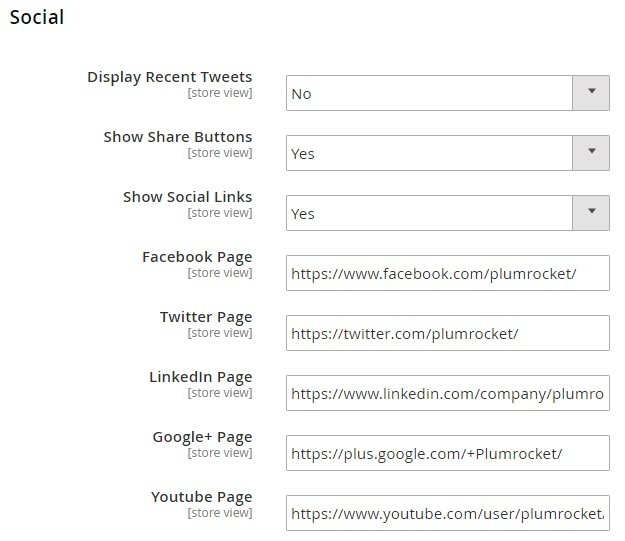 In Social, the Plumrocket Coming Soon & Maintenance Page Magento 2 extension allows you to activate 3 features: Recent Tweets, Share Buttons, and Social Links. Next, you should provide links to your social media pages on Facebook, Twitter, LinkedIn, Google+, YouTube, GitHub, Flickr, and Pinterest. The Meta Data section allows to specify page title and meta description and keywords. Thus, you make your Coming Soon page SEO-friendly. 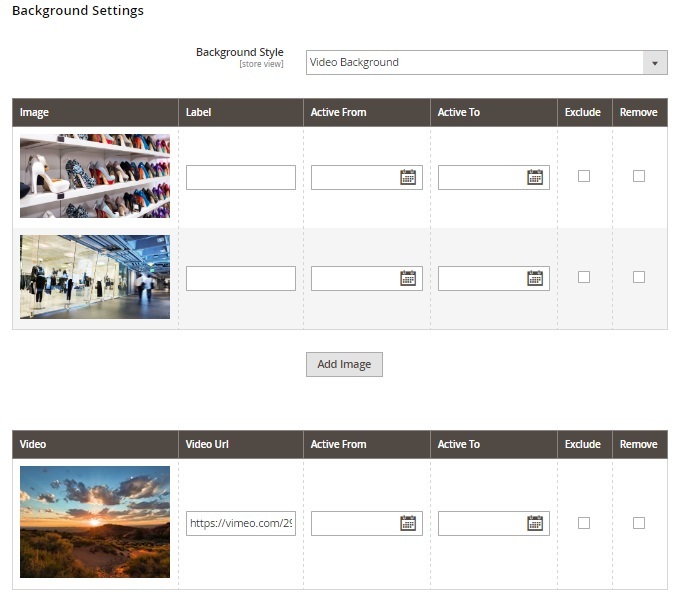 Background Settings allow you to choose a style of the Coming Soon page background. It can be a single image, a slide show, or a video. As mentioned above, you can specify a period of activity for each image and video. Besides, it is possible to add labels for images. To create a custom video, provide links to .mp4, .webm, or .ogv files. 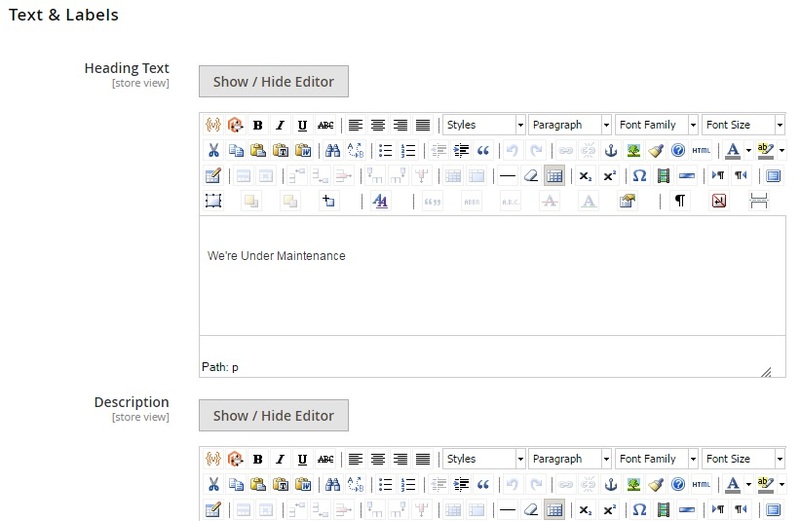 In its turn the Maintenance Page Tab is divided into 4 sections: Maintenance Page, Configuration, Text & Labels, and Background Settings. 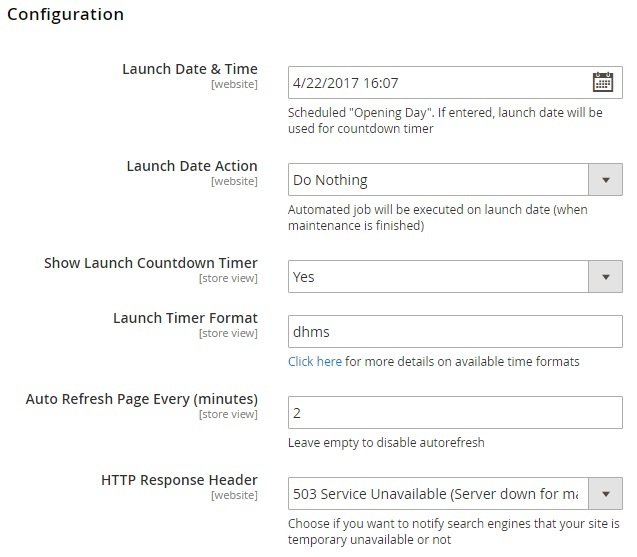 In Configuration, the Plumrocket Coming Soon & Maintenance Page Magento 2 module provides already familiar parameters: Launch Date & Time, Launch Date Action, Show Launch Countdown Timer, and Launch Timer Format. Besides, you specify how often the page should be auto refreshed and select an HTTP response header: 503 Service Unavailable or 200 OK. In Text & Labels you can create text messages for page heading and description. More features are available under Stores -> Settings -> Configuration -> Plumrocket -> Coming Soon & Maintenance Page. There are 3 sections here: General, Email Templates, and Mailchimp Synchronization. 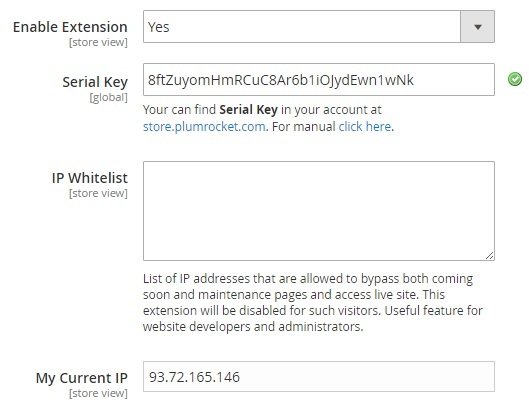 The General section allows to enable/disable the extension, enter the serial key, create a list of IP addresses to allow admins and developers pass restrictions caused by Coming Soon and Maintenance Mode pages, and view your current IP. In Email Templates, select an email template informing about your store launch. 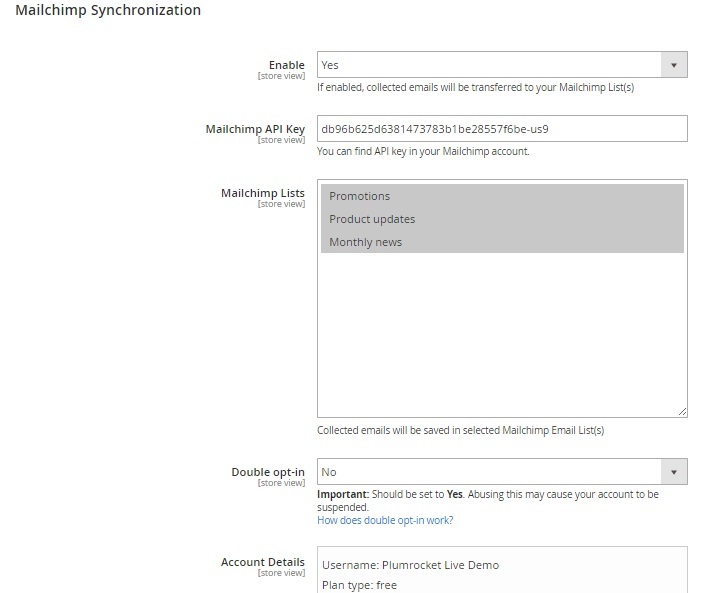 In Mailchimp Synchronization, you can transfer collected emails to your Mailchimp, specify your Mailchimp API key, select Mailchimp lists, enable double opt-in, and view account details. These are all backend settings of Plumrocket Coming Soon & Maintenance Page Magento 2 module, so let’s proceed to the frontend appearance of the extension. Coming Soon page with timer, background image, signup form, share buttons and social links. For examples of slideshow and video background, follow the link in the end of this post. 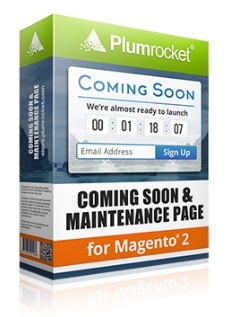 Plumrocket with its Coming Soon & Maintenance Page Magento 2 extension takes care of your website appearance when it is not yet launched or is under maintenance. The module helps to create professionally looking coming soon and maintenance pages, so you can inform store visitors when your store will be live again in the most efficient manner. 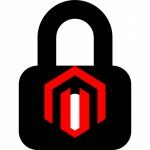 The price of the Magento 2 extension is $149, as for its predecessor, the Magento 1 version costs only $79.